For over 50 years, generations of young people from across Lancashire have been making music together in our county ensembles. Building on this long history, the six ensembles we have today are vibrant, aspirational and exciting to be part of, meeting the needs of young musicians in 2018. 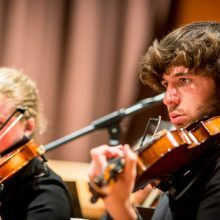 The ensembles enable committed young musicians to take their music making to an advanced level, working alongside professional directors and tutors. The opportunity to be part of an ensemble is an important achievement and something that people remember for the rest of their lives. Recently one of our ensemble players gained a distinction in her Grade 8 ABRSM exam on saxophone. 15 year old Charlotte Turnbull, started with Lancashire Schools Jazz Orchestra and progressed on to Lancashire Youth Jazz Orchestra. A distinction in this exam is a major achievement and having the opportunity to play in the jazz orchestras has been a key part of Charlotte’s musical development. Many county ensemble alumni go on to pursue careers in music. Bassonist Sarah Hoyle recently graduated with a 1st from the prestigious Royal Academy of Music. She started learning the bassoon at Burnley Music Centre when she was 9 and was soon accepted for lessons at Junior RNCM, but she continued to play in ensembles at Burnley Music Centre, as well as progressing on to the Lancashire youth orchestras. She is continuing her studies this year at the Royal Academy of Music next year to complete her Master’s degree.